Hamas officials just published a video of Gaza that is raising some serious questions for those who claimed Gaza is being choked by the Israeli siege. For years Arabs have been claiming that people in Gaza are starving and their lives have been completely destroyed by Israeli aggression. 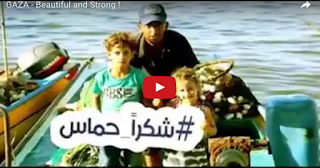 This video, produced by Hamas and called 'Gaza, Beautiful and Strong', paints a very different picture. Either the Arabs lied about the situation in Gaza and about the siege, or the building materials, produce, toys, food and everything used to build a mall, a water park and three hotels magically appeared on their own. Does Gaza look like a ghetto or a jail, as anti-Israel activists like to call it, or does it look like a nice place to vacation? I am thinking of taking the family there, I hear it is a BLAST! After watching this video, do you believe there is a siege on Gaza that is choking the people there or only making sure no more missiles are shot? Let me know what you think in the comments below.